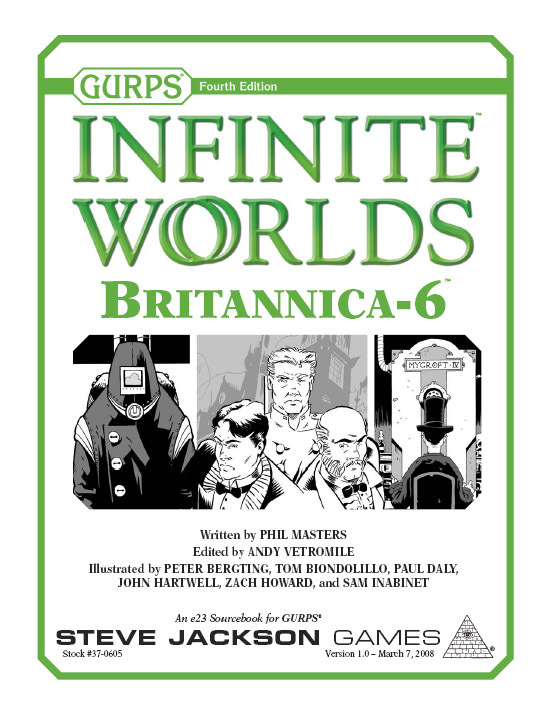 A lot of basic historical, cultural, and technological information relevant to the alternate history and divergent technology of Britannica-6 can be found in assorted places on the Internet. As usual with that source, readers hoping for complete reliability and accuracy shouldn't trust everything they read, but it's easy to find material that's good enough for a game set in a wild other reality. A number of websites are devoted to historical romances and more highbrow novels such as the works of Jane Austen; as many of these are set in the Regency period, and some of the modern novelists take reasonable care over their social details and period terminology, sites aimed at their readers can be useful. As a more conventional, academic source the Encyclopaedia Britannica is, as ever, invaluable. Churchill, Winston S. A History of the English-Speaking Peoples, Volume IV (Cassell and Company, 1958). A handy popular history covering the relevant period. Pool, Daniel. What Jane Austen Ate and Charles Dickens Knew (Simon & Schuster, 1993). A useful introduction to the practicalities of 19th-century life. Much of the coverage is of Victorian rather than Georgian topics, of course, but careful reading easily identifies the parts that should apply to Britannica-6. GURPS Steampunk, by William H. Stoddard, is a comprehensive guide to running variant-technology, 19th-century-based games. 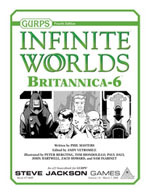 Its companion, GURPS Steam-Tech, compiled and edited by Stoddard, has many ideas for gadgets and devices, many of which might well fit on Britannica-6. GURPS Age of Napoleon, by Nicholas Caldwell, is a sourcebook for the Napoleonic wars, including extensive information on Georgian-period living (especially military life), much of which is relevant to this alternate timeline. It's an invaluable guide to the period immediately before the divergence point.